Apple has seeded iOS 8.2 Beta 2 Firmware (Build: 12D445d) for iPhone, iPad, iPod Touch and Apple TV. The latest second beta version update of iOS 8.2 Firmware is available to all iOS developers and non-developers (general users) for experimenting and testing of various features, functionalities and applications. We have posted the Direct Download Links of iOS 8.2 Beta 2 IPSW for iPhone 6 Plus, iPhone 6, iPhone 5S, iPhone 5C, iPhone 5, iPhone 4S, iPod Touch 5G, iPad Air 2 6G, iPad Air 5G, iPad 4G, iPad Mini, iPad Mini 2, iPad Mini 3, iPad 3G, iPad 2G and Apple TV 3G below. The official release notes of iOS 8.2 Beta 2 (Build: 12D445d) Firmware contains; "Fixes for bugs, system performance enhancement and stability improvements etc." 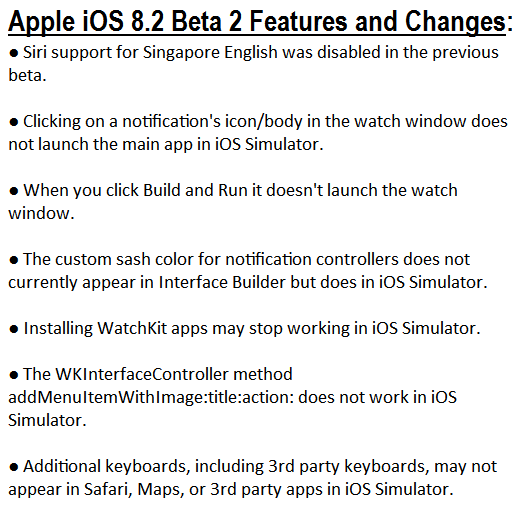 You can read full changes and features of iOS 8.2 Beta 2 Update HERE and in below image! How to Install iOS 8.2 Beta 2 Update? You can automatically install iOS 8.2 Beta 2 Firmware via Over-the-Air process. 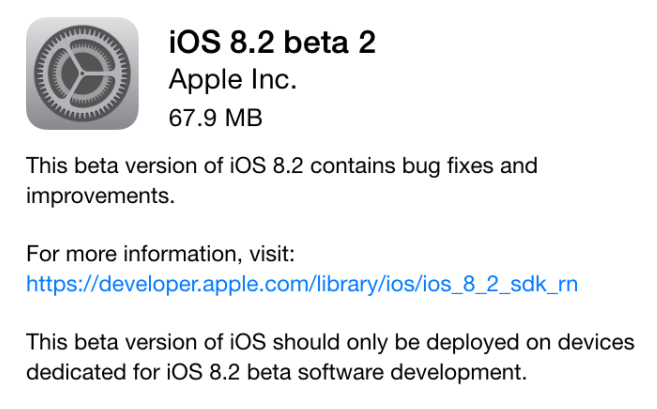 To get iOS 8.2 Beta 2 OTA Update, just navigate to Settings > General > Software Update function under your iOS device. All Apple iOS developers can go to iOS Dev Center website for official iOS 8.2 Beta 2 Downloads, And all iOS non-developers can manually install and activate iOS 8.2 Beta 2 via iTunes without Apple UDID and iOS developer account. You can Untethered Jailbreak iOS 8.2 Beta 2 Using Taig Jailbreak Tool for iPhone, iPad and iPod Touch. Follow our Guide and Tutorial HERE.